The club received an invite to the Laconia Main Street Program’s “A Palette Affair” auction. The event will place this Friday night, November 14th at the Belknap Mill. There will be music, champagne, and a dessert reception. For a preview of the items, log on to www.laconiamainstreet.org. Tickets are $10 and they are available at the Sundial Shop, Sawyers Jewelry, and Greenlaw’s Music. There was a Kiwanis KARES event at Pleasant Street School. Kathy Calvin, Joe Adrignola, Don and Sue Nelson, and Randy Brough were all on hand. The theme was “History or Mystery” and kids got to vote on their favorite. Kathy Calvin reports that MYSTERY was the hands down winner. The next KARES will be at Woodland Heights Elementary School sometime in December. Kathy will have more details and a signup sheet soon. Stay Tuned…. Lt. Gov. Joe Collie updated the club on his visit to the Mt. Washington Valley Club last Wednesday. The club had about 35 members in attendance. They just held a successful fundraiser on the Conway Scenic Railroad and are gearing up for the distribution of their coupon passbook, which is due to be released on or about Thanksgiving weekend as the coupons will be valid for use starting December 1st. They are also into their Angels and Elves promotion, which helps more than 600 kids in Carroll County during the Christmas season. They started a weekly 50/50 raffle to help their general fund. Two weeks ago, they had 45 bucks to the winner and last week’s winner took 36 dollars. Take a peek at their website, www.mwvkiwanis.org. Lt. Gov. 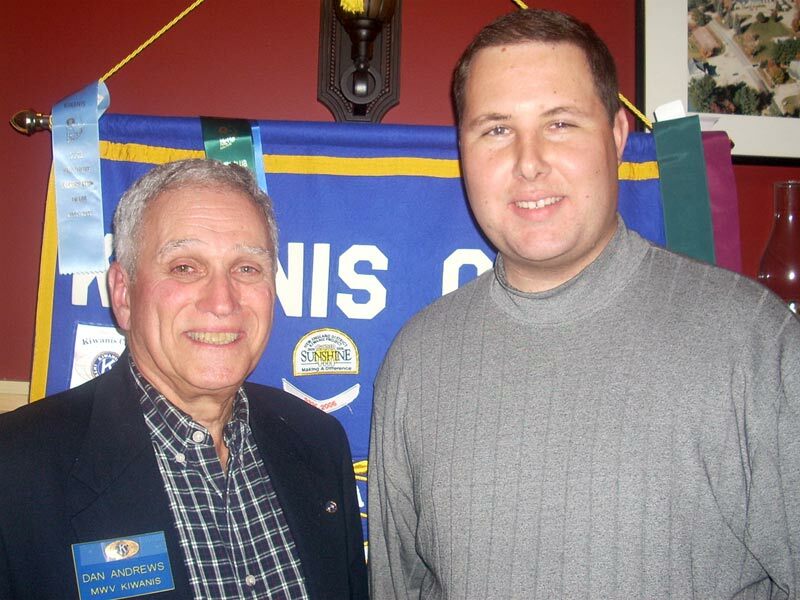 Joe Collie with Dan Andrews, president of the Kiwanis Club of Mt. Washington Valley. Photo by Susan Staples Smith, Secretary of the Mt. Washington Valley Club. Lt. Gov. Joe will be making a trip to the Franklin Club next Monday night, November 17th. Joe said that if anyone is interested in going with him, we could make it an interclub. The meeting is at the same time as ours…Monday at 6pm at the Soda Shoppe in Franklin. If you’d like to attend, e-mail Joe at joecollie@gmail.com. The Laconia High School Football team advanced to the state championship game with a big win over Kennett in the playoffs last weekend. The home playoff game brought a big fund raiser for the Key Club and Kiwanis was there helping them out in the snack shack. Kathy Calvin, Denise Dow, Jim Fortier, Larry Murphy, and Chet Cilley were all on hand to help out. The Sachems will play Plymouth for the state title on Saturday. The game will be played in Plymouth. Thanks to all who helped out in the shack this season and good luck to the football team! Kathy Calvin reminds all that she has tickets to the Key Club Spaghetti Dinner coming up on November 19th. It’s a fund raiser for the food pantry. Tickets are $5 for adults and $3 for students and veterans. It’s a great thing for the Key Club to take this initiative and we should support them the best we can. Please attend if you have time on Wednesday, November 19th. If you want tickets, email Kathy at kgc@mlolaw.com. Santa will be coming to Kiwanis on Monday, December 8th…it’s our annual Children’s Christmas Party. This means gifts for the kids, mac and cheese and hot dogs for dinner and a visit from the big guy himself. 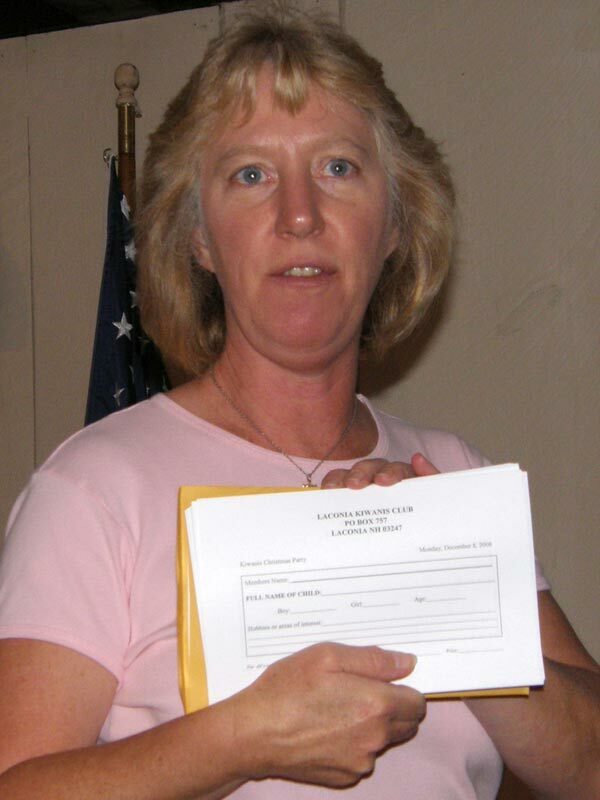 Kathy Calvin asks the club to take gift sheets and sign up children and grandchildren if you are planning on attending. She will be on vacation the week of Thanksgiving, so if you could do this before hand, she would be grateful. Then she could go shopping while on vacation. Please fill out signup sheets at next week’s meeting if you have a little one coming for the fun. Kathly extends an invite to the annual Children's Christmas party. 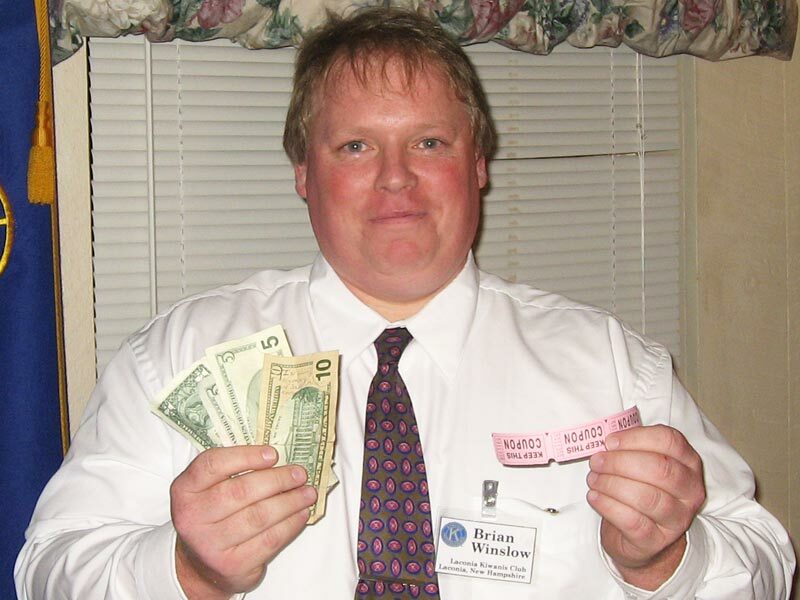 President Brian employs "executive priveledge" when it comes to the 50/50. Brian gave one for winning. Joe Collie gave one for Sophie turning two Saturday. 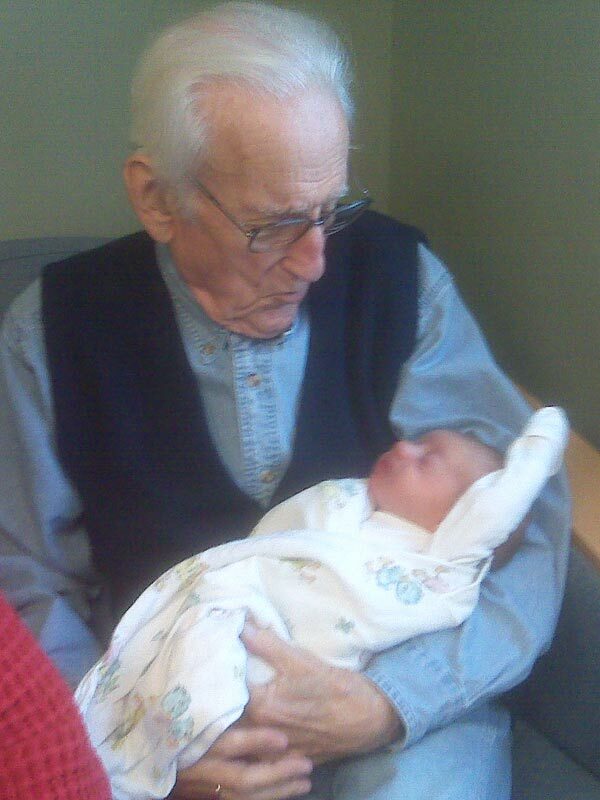 Ed Chertok gave 5 for his great grandson, Zachary Osman, being born Wednesday of last week. Ed Chertok with his great grandson Zachary Osman. 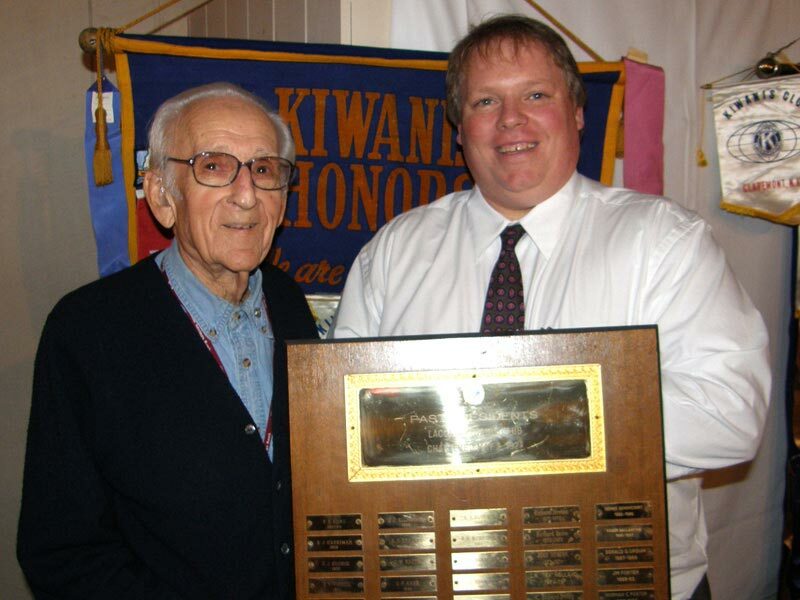 Ed Chertok gave a talk about the history of the Laconia Kiwanis Club. 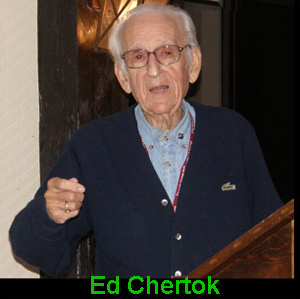 Ed’s Dad, Max Chertok was a charter member in 1927. Ed was 12 at the time and remembers when his dad came home and told his mother that they were bringing a Kiwanis Club to town and that she needed to go and buy a new dress because they were going to this meeting of the new club. Ed remembered all the presidents of the club and said the club was sponsored by the Concord Club. The Concord Club’s president at the time was Styles Bridges, a future NH Governor and US Senator. In 1935, Ned Roberts was president. Ned was in education and Ned is also the guy that our Kiwanian of the Year Award was named after. Another president of the club was Fred Tilton. Ed shared the story of Tilton and his career and children.Russ Beane and D. Scott Beane’s grandfather, Dana Beane was president of the club in 1939. Max Chertok was president of the club in 1940. In 1943, Ken Hopkins was the president. He was a city councilor and ran a hardware store in Lakeport. 1949 saw Tom McIntyre become president of the club. He would go on to become a US Senator. Ed went on to recall some memories of the club selling tickets to the ski jump races and peanut sales. The first fund raiser he remembered was the Marine Band coming to the Colonial Theater. His dad gave him tickets to bring to school and told him to tell his friends that the Kiwanis Club was having a free concert. He said the biggest fund raiser was an auction that he said raised about $15,000….he said that in those days that was the equivalent of $125,000. Photo albums were passed around and we all had a good time strolling down Kiwanis memory lane. Ed said he could have gone on for hours longer, but cut it short due to time constraints. Roger Webster pointed out that at one point, the Laconia Kiwanis Club had a member in the US Senate (Tom McIntyre) and the US House of Representatives (J. Oliva Huot) at the same time! Watch a few video highlights of Ed's presentation on you computer. WAIT FOR VIDEO TO FULLY DOWNLOAD BEFORE PLAYING. 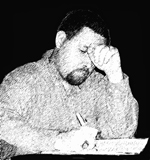 Hear how the club of the past kept speakers from talking too long by clicking here. Hear about the first fund raising event of the club by clicking here. 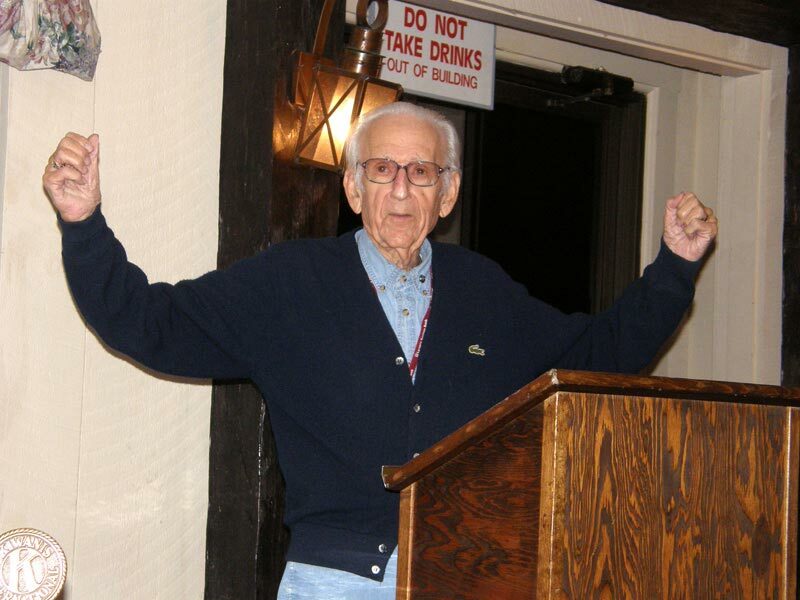 Hear about Dana "Ace" Beane, president of the club in 1939, by clicking here. Note: An audio of Ed's full presentation can be posted on this website (in mp3 format) if there is enough interest by the membership. Send an email by "clicking here. Ed's father, Max, has his name on this plaque...soon Brian Winslow will, too.